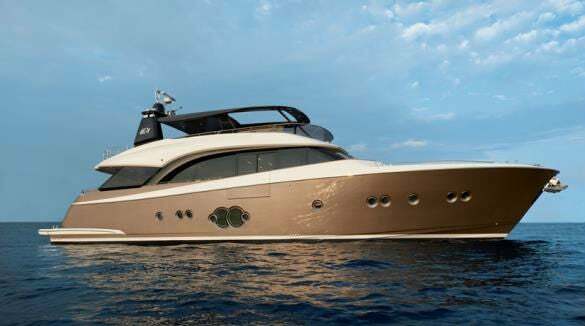 Monte Carlo Yachts’ newest model, the MCY 86, which premiered at the Cannes Boat Show last September, has found her first owner in Hong Kong. The MCY 86 is the fourth model in the collection, a range which now comprehensively covers the luxury yacht sector. Each MCY model perfectly exemplifies the brand’s distinctive values – the ability to blend naval design, style and technology. The new MCY 86 takes the yard’s product range to a new level: a larger, more spacious and more exquisite yacht, which meets the needs of boat lovers who want to enjoy every instant on board to the maximum. Made in Italy, made in France: MCY 86 again keeps the promise of bringing together sensitive Italian tailoring with the productive capacity of Groupe Bénéteau, which is a world-renowned model of technological and industrial efficiency. The technical and aesthetic elements blend together, efficient production brings out both the care with which it is made and also the search for exclusive details. It is an approach which is confirmed by the contribution made to the yacht by some big names in the fashion and style world: the living areas of the boat are actually embellished by fabrics and material from Hermès, Armani, Frau and Pierre Frey. Made by Monte Carlo Yachts. The MCY 86 shows herself to be a real expression of the approach and the style of Monte Carlo Yachts, starting from the strong family resemblance of its external lines. The design of the whole range is by Nuvolari and Lenard. The two designers, who have some amazing mega yacht designs in their portfolio, have reached a new high with this project. The novelty lies in the absolute beauty of a decisive approach which can soften once on the sea: the perfect choice for a boat which can be relied on for top-level nautical performance and which looks to offer elegance in every detail. Contemporary refinement which does not give in to minimalism, Nuvolari and Lenard have designed a classically-styled boat, without compromising with retro tastes or irritating aerodynamic excesses. Made together with yacht owners. The new MCY 86 increases the range of customization and offers an experience of made-to-measure luxury. Radically different configurations which mean that each owner can personalize the yacht to fit their own lifestyle. 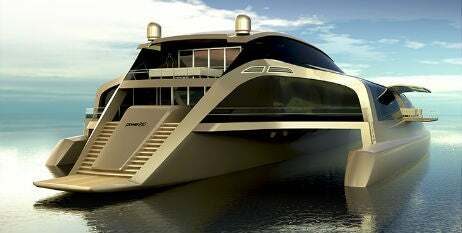 The layout variants include all three decks, with three, four or five below-deck cabins and different distributions of the rooms on the main deck and the flybridge. All of which means a constant assurance of exceptional levels of livability. Creating space for elegance and comfort. There is an immediate – and extraordinary – feeling of space and comfort from the very first step on the main deck. The stern area, which is completely separate from the extended flybridge, offers guests a large area normally associated with larger vessels. The steel and glass fashion plates, which are a feature of Monte Carlo Yachts further increase the feeling of privacy on board. The foredeck design – which is a highly distinctive part of the range – is expressed to the full here. The Portuguese deck leads to an exquisitely private living room. A real lounge which adapts to different uses during the whole day on board. The extensive area is ideal for using large sun loungers, comfortable sofas and a table where meals can also be eaten in the shade, enjoying the sea view with one’s family and guests in a space which is both open and private. You have the certainty of being on board a mega yacht: no other vessel of under 30m is capable of providing an area comparable to this. The flybridge can be fitted with a large Jacuzzi. The bar area, the open-air kitchen and the numerous sunbathing and living areas can be protected with a carbon fibre T-top with soft-top and electrical opening, another characteristic element of the MCY collection. In the interior, the living room fulfills all the promise of the external spaces: the area and space increase in a succession of luxurious and comfortable living areas, which are ideal for conversation, entertainment, relaxation or dinners with guests. Another new aspect on the 86-foot boat are the opening side platforms. Available on both sides, they can be transformed into exclusive terraces overlooking the sea, giving unequalled, unobstructed views of the horizon even from inside the yacht. Below-deck layouts are also made to measure. The rooms are always spacious and are embellished with highly-prized materials in all the numerous variants available. The height of comfort can be seen in the master cabin: a truly full-beam suite with a sizeable office and large walk-in cupboard. The unique style of Monte Carlo Yachts comes out of every area of the boat, and is reinforced by the choice of highly-prized materials, such as white Volterra alabaster, cedarstone marble and mocha cream limestone. Precious materials that create a feeling of elegance, which is further refined by the input of some of the most important names in international fashion and design, and the use of Venetian mosaics hand-made in Murano glass. Every detail helps to put the new Monte Carlo Yachts 86 at the top of its category, and indeed – as stressed by the designers Carlo Nuvolari and Dan Lenard – “the MCY 86 has significant usable areas and the internal lay-out of a much larger boat. The layout for owner and guests focuses on external views and consequently on natural light. The new MCY 86 is in a class of her own, offering technical, living and aesthetic solutions which cannot be found in similar vessels of the same category.